Gold bugs are paying attention to the breakout in the gold and silver today. Could this be the breakout that propels the precious metals to new highs? Or is the bullish buying of the shiny metals a passing summer fling? Some respected analysts characterize the current bullish interest in gold and silver, as well as the summer rally in stocks is invalid, citing the lack of trading volume, which “is the only way to confirm a bullish trend”. That opinion has led many to short stocks and some commodities. Others have elected to stay on the sidelines, satisfied to stash their capital in Treasurys. Technical analysis sheds some light on the nature of traded assets. Readers of these pages last week (“Charting Gold”) saw our forecast of the potential breakout in gold based its bullish ascending triangle chart pattern. In that analysis, we identified the breakout level to be $1634/oz. Soon after the New York open Tuesday, spot gold jumped to just over 1640, clearly above the trend line breakout level on high trading volume. To be considered a valid breakout, gold needs to close above 1634 over the next few trading sessions with volume above 110,000. The target price for a valid breakout from the bullish ascending triangle pattern in gold is 1725. Ichimoku Kinko Hyo indicators show that the 1725 target price has been a strong support/resistance level in the past. We can see from the weekly basis chart the projected cloud is showing 1723.80 as resistance. We saw gold trades close to this level before the run up last August and for several weeks of sideways trading from April through May this year. Another significant feature on weekly chart below is the bullish cross of MACD oscillator. 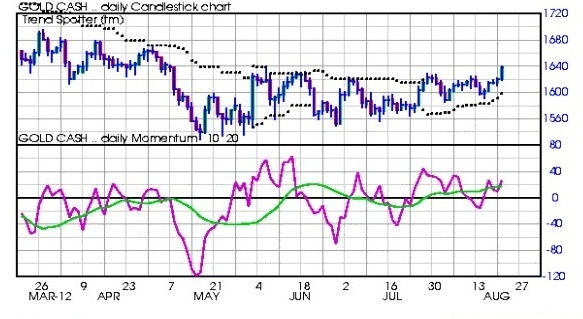 Several traders use MACD crosses to execute trades because it clearly identifies shifts in momentum. Whether or not MACD is used as a trigger for a trade, it is a useful measure for confirming other technical indicators, such as a bullish cross of Tenkan Sen from below the Kijun Sen, which remains intact since it appeared on the July 26 daily Ichimoku charts for gold. Some traders rely on the TrendSpotter indicator, a popular computerized trend analysis available on most trading platforms and on Barchart.com. The indicator combines elements of wave theory, market momentum and volatility to display the general trend for a given traded asset. Traders read the TrendSpotter “dots” which are graphic codes for more technical analysis going on in the background by computer algorithms. A single dot above the price indicates resistance and a bearish trend. A dot below the price shows support and a bullish trend. When two dots appear, one above and one below the price, the trend is neutral indicating “hold”. We can see that TrendSpotter dots have followed the upward trend in gold building from late July, and accelerating in the last three trading sessions including sessions. The study at the bottom of the TrendSpotter chart is a momentum indicator, which shows relative price differences between the current price and the price 10 and 20 sessions ago. The waves above and below the zero line show bullish and bearish price momentum. The height (amplitude) of the wave signifies the strength of the momentum. 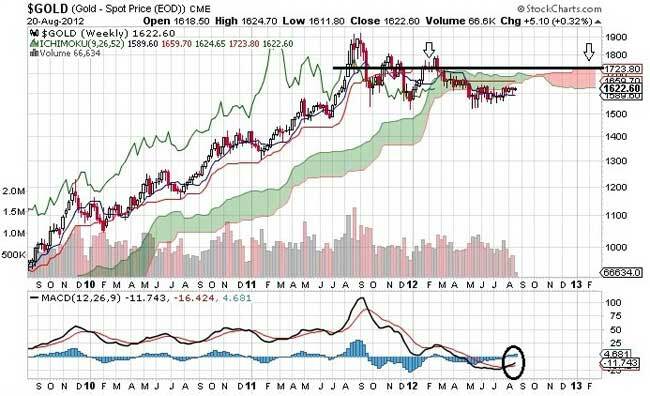 These data are showing an accelerating bullish TrendSpotter trend for gold, with modest momentum at the moment. can turn into “The One”.